Optional: Pretty waitress +50 EUR, Prosecco (4 bottles) +50 EUR, and many more! We offer the best Beer Bike service in Prague. Our ORIGINAL PRAGUE BEER BIKE is the most comfortable bike in town covering the city’s major sights. Made of light-weight materials and equipped with comfy chairs, bar on board with draft beer, audio system, Wi-Fi and night lights, it has all you need for your extraordinary ride throughout the beautiful city of Prague. 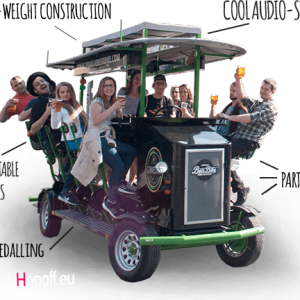 Maximum capacity for one Beer Bike is 13 people and we have two Beer Bikes ready for you with total capacity 26 persons! Have a wonderful time with your friends while riding our fantastic bike through the city streets. Within a two-hour ride, our English speaking driver will show you the city from a whole new perspective that you will never forget. 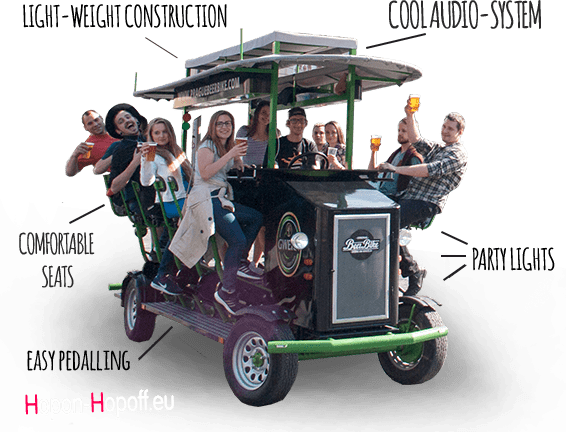 Book the ORIGINAL PRAGUE BEER BIKE today!